That's very odd. I've contacted Andrew to see if something went wrong. Thanks. Even if it ends up being a temporary error, duplicating information as a precautionary measure isn't wasted effort. I must have overlooked the original post, so I'm actually noticing this information for the first time. Here we go again... it seems the update check in SeaMonkey Portable doesn't work, the following official release info from the SeaMonkey project page notwithstanding. Automatic upgrades from previous versions are, for most configurations, disabled for this release. 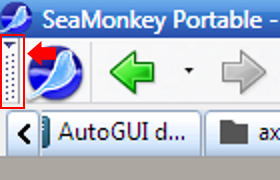 Please download the full installer from the downloads section and install SeaMonkey 2.49.1 manually over the previous version. Although the developer did updated it, the official addon page at https://addons.mozilla.org/en-US/seamon ... -for-seam/ isn't reflecting it. I have updated the new version 0.0.22 a month ago but it isn't listed in the versions list and the reupload attempt ends with 'version 0.0.22 already exists' error !? Have no idea, what's wrong. Will send the feed to the AMO people. During the whole Meltdown craziness, this is the wrong time for an update functionality to break. An even simpler (albeit completely counter-intuitive) route is available. If while going to be "Mozilla Add-ons" webpage you get a message like the one displayed below, you can still go ahead and click the "Download Anyway" link and follow suit to install it -- the worst that can happen is you will get a non-working extension, which you can easily remove via Seamonkey's 'Add-ons Manager' interface. Last edited by Midas on Sun May 06, 2018 2:08 am, edited 2 times in total. Here's an old tip about how to disable them. I don't know if it still works. Works! Thanks mate, you're a lifesaver. SeaMonkey 2.49.4 released, dated 2019-07-27 (release notes at www.seamonkey-project.org/releases/seamonkey2.49.4/).